In this Information Sheet we highlight the procedures for the general cleaning of concrete surfaces and the removal of dust, dirt and soil contamination. For further advice on the removal of specific stains (e.g. oil spills), we refer you to the Information Sheet on How to Remove Stains from Concrete. 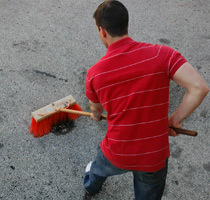 The procedures explained are for the cleaning of hardened concrete surfaces. You should avoid the use of these procedures on concrete less than seven days old. The reason – there is a risk of abrading and/or damaging the surface and/or finish of the concrete. Prior to undertaking cleaning by utilising any of the methods outlined below, provision should be made for the removal of any wash water and contaminants generated by the cleaning process and any loose material (e.g. leaves), should be brushed or blown off the surface. The three cleaning methods in increasing order of intensity are: water washing, pressure washing and steam cleaning. Various general purpose concrete cleaning products (detergents and chemicals) can be used with any of these methods to reduce the effort required to clean the surface. Whichever method is used, the cleaning should be carried out systematically from one edge or corner. only 100–200 kPa (15 to 30 psi). Water washing would also include the use of a bucket of water and scrubbing the surface with a stiff-bristled brush or broom. Even with the use of a hose, because of the low pressure, scrubbing the surface with a stiff‑bristled brush or broom may be required to loosen stubborn deposits. Washing with pressure is simply water washing with a significantly higher water pressure – no need to manually scrub the surface. Electric or petrol driven pumps are used to increase the water pressure for domestic models and larger commercial models. The increased pressure allow you to create a water jet that has sufficient force to break the bond of the dirt or other contaminant to the concrete surface, allowing it to be washed or removed from the surface. Fan spray nozzles are the most common for pressure cleaning because they allow a wider area to be cleaned with each pass. Nozzles producing a narrow concentrated jet are seldom used for general cleaning, but may provide greater force for removal of small stubborn deposits. With fan spray nozzles, the force the water exerts on the concrete surface quickly decreases with the distance from the surface. This is because the width of the fan increases with distance and the air provides considerable resistance to the small water droplets created by the higher pressure atomising the water as it leaves the nozzle. The nozzle distance from the surface should therefore be adjusted to provide optimum cleaning: close enough to dislodge the dirt but far enough not to damage the surface. The pressure of domestic type machines is sufficient for general cleaning of concrete surfaces. The pressure and the rate of water flow combined do, however, affect the cleaning ability of a pressure washer or the speed with which a surface can be cleaned; the higher the pressure more water will be delivered enabling you to held the nozzle further from the surface to achieve the same force at the surface. This results in a wider fan width at the surface – this means that a larger area can be cleaned with each pass. may also allow higher temperature water to be used. Detergents are more effective and faster at emulsifying the dirt as the temperature increases, allowing the bond between the dirt and concrete surface to be broken more easily. detergents and chemicals, therefore they should first be trialled on an inconspicuous area. Only when their effect has been assessed should they be used more extensively over the surface to be cleaned. Note: Some cleaning detergents and chemicals may affect adjacent finishes by staining woods, damaging metal and painted surfaces and etching or leaving residue on glass surfaces. There is also a risk that the utilizing of these products may result in damaging or killing lawn or plants in your garden. They also may be harmful to humans. The manufacturer’s directions of use and recommendations should always be followed. After washing, the surface (plus any adjacent surfaces) should be thoroughly rinsed with clean water to remove all traces of the detergent or cleaning chemical. chewing gum that are resistant to other cleaning methods. Another advantage of steam cleaning is the ability to disinfect by killing bacteria. This may be a particularly desirable aspect for cleaning surfaces in food-preparation areas in the food industry. 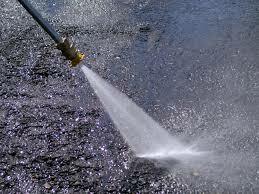 Steam cleaning concrete may be difficult and will typically be considerably slower than pressure washing. As such, it is often used in conjunction with water or pressure washing to remove specific stains or particularly stubborn deposits. If considering steam cleaning, the use of an industrial/commercial high-pressure steam cleaner together with detergents or non-solvent emulsifying agents suitable for use in high-pressure steam cleaners will reduce the time required. After removing the contaminants, the surface should be thoroughly rinsed with clean water. Disclaimer: This article is produced to provide information on the uses of cement, concrete and aggregates and to also provide information on how to clean these surfaces. The information provided is intended for general guidance only and in no way replaces the services of professional consultants on particular projects – no legal liability can be accepted by CCAA or The Cleanchem Company.